. . . and I’m scared to death! Yep, that’s right. Well, remember in the beginning of the year when I adopted the word ‘brave’ for my hopes and plans this year, well – this is brave. Before I get to Day of Giving Friday, I want to share the dates and times I’ll be presenting on Create and Craft TV. So yes, I’ll be in the UK demonstrating my new dies along with a trusty companion and long time Spellbinders Ambassador – Christine Emberson. Together we will show you two styles of working with my new collection and a unique way to polish it all off. Let’s celebrate with a wee giveaway on my blog on Monday, okay? In the mean time, favorite peeps, today is Day of Giving Friday and I whipped up a little card to giveaway to one of my lovely readers. Simply leave a comment and I’ll randomly pick a name. Today I’m showing a ‘friend’ card inspired by this lovely sentiment that I grabbed off of Ebay. Yes, I could recognize the style of stamps as PSX that is no longer in business but was years before their time in classic, professional, romantic stamps. I have quite the collection and I’m tickled to add this one. 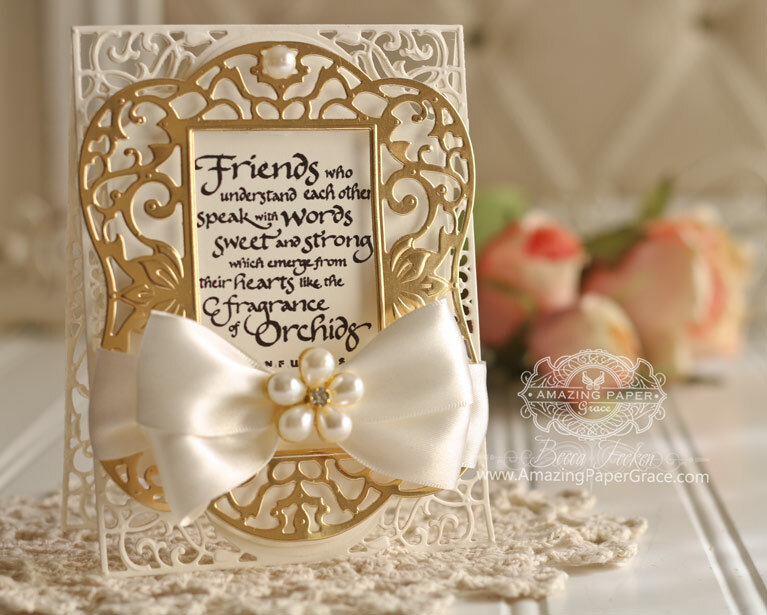 I thought it would fit famously with Spellbinders Labels 54 Decorative Elements and I layered it onto a hinged filigree card base made using Spellbinders A2 Divine Eloquence. For new readers, every Friday it’s my pleasure to give away a card. The card goes to a randomly picked reader (worldwide) who leaves a comment in our conversation. Want to know more about Day of Giving, here’s a link to my FAQ’s just check out #11. You can check to see if your name is on the list of winners HERE! For your comment: What’s the best trip you ever took? Oh Becca, you have certainly made my day complete with this disclosure, I so look forward to seeing you on C&C with the new spellbinder dies and with Christine Emberson, I will be going to my craft club in the morning and back in time to make a cup of tea and watch the show, yipee so looking forward to it. Oh and by the way this is a super duper card, I wonder if someone in the UK will be lucky enough to win it, wish it was me, good luck everyone. PS don’t be too nervous, we are a great crowd in the UK and will cheer you on all the way. As always, gorgeous card, so feminine, just lovely. Oooh! So excited for you and sending prayers and hugs. Have a safe trip and try to sleep on the plane if you suffer from jet lag as we are several hours behind and you will be landing early in the morning – unless you are on a day flight to the UK. But you will ace the shows! Your presentation style is soooo good! Golly – best trip…. My favourite was probably driving through Switzerland on the way to Venice – mountains, waterfalls, trees and cabins. We stayed overnight in a hotel on the shores of Lac Léman (Lake Geneva) and our room had 3 balconies with huge windows. We arrived in late May in the early evening, opened all the windows and suddenly there were Church bells ringing across the lake and an eagle hung in the air over the water. A truly magical moment. Beautiful card – I love the gold paper. It just makes the card pop. Have fun in the UK. try their Twinings vanilla teabags. You will be just great on TV. You have someone with you so together you can make it work. My best trip was to France. Paris was a delight and the people were very helpful to us. Wow really are stepping out of your comfort zone but I know you will be fabulous. Relax and enjoy this new experience. I am so glad you are coming over to the UK. Wrap up warm as it is getting cold over here. I love all your collections so far and can’t wait to see the new one. Oh sweet Becca, such a question, well, My best trip so far, Good Lord I do there’s more to come,….was by cruise ship 14 days, seeing all the many island countries in the whole of the Caribbean , such beauty in each culture , and the people , oh so cheerful and pleasant….But I would luv to go visit the British Isles, by cruise ship tho, not plane, ( I have a Blood Clotting disorder which make me more subject to, more Blood clots…..
so the best trip I ever took was the year long honeymoon with my dh in korea while he was stationed there. I was on my own because it was a remote assignment for him. I went and found a job and he was moved 3 times and I met many wonderful people and 1 hour film developing had just become popular and while on a side trip I found a place that did it and it was the talk of our tour. I met a family that I ended up living with for about 5 months and traveled for about 2 months to a different place every weekend. I learned how to write the name of the town I lived in and could order wontons and coke to be delivered. wonderful memories. I took so many pictures. the young girl about 13 use to laugh when she would see what I took pictures of. they were everyday things to her but very different to me. the mother of the family could speak little englsh and I spoke even less Korean. the girl was amazed that her mother and I communicated so well. she would laugh and say we could communicate in three words more than she could with a whole paragraph. WOW Becca I will have to see if I can find them on the internet and watch them. I love your cards they are so inspirating. The best trip I took was a 5 month journey from Brisbane Australia to Darwin then Darwin to Cairns back to Brisbane. 12000 kms in total. It was awesome. Becca, I am so excited for you and your TV debut. what a wonderful new adventure ! I love this card and the charming sentiment. I believe there’s NO ONE BETTER QUALIFIED to be appearing on Create and Craft, no one!!! Your beautiful style is a perfect fit for what I see as the British style, and those in Britain and beyond are going to LOVE YOU and will LOVE what you create and what you bring to them to buy! Becca, this is God’s path for you, He chose for you to go there, and He will not let you down now. This is simply another turn in your path for something GREAT! He would never ask you to do anything that you and He could not accomplish together, and we KNOW that He can do anything! I understand your hesitation, but God will give you the words to say, and you will prepare as much as you can, and the rest will be left to Him to help you. 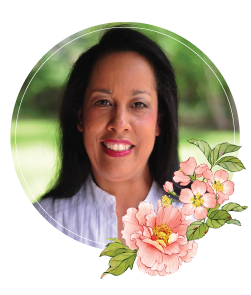 I’m thrilled that Spellbinders has chosen you, you are a PERFECT FIT!!! I have lived in Britain–for a year while doing a graduate school course, then went back to the US to graduate school there, I loved my time in the UK! It seems they make HUGE cards over there, your cards will work well in whatever size you make. I love them, and am always amazed and intrigued by your ingenuity, your wonderful artistry, and your fantastic sense of style. You’ve got this, my friend!!! I cannot wait to watch you on Create and Craft!!! Just remember you have all of the words inside you that you will need!!! Nothing will be perfect on live TV, things happen and you will just go with the flow and you will do what you do best–create, and your love of what you do will be infectious–think of the wonder of introducing papercrafting and using a die-cutting and embossing machine to people who perhaps have never made a card. How neat is that!!! I’ll be praying for you. I can’t even express how excited and thrilled I am for you, and I have COMPLETE CONFIDENCE that you have this, you and God are a team that can do anything!!! Hey Becca, GREAT BIG WOW! Really look forward to seeing you, and I know the UK will just love what you have for us. They already do! Hope you have a good journey and enjoy your stay. And……..Remember to pack your thermals! Thank goodness Create and Craft have finally found you! That is so amazing Becca, and I´ll definitely be watching Create and Craft these days, that´s for sure. I can´t wait to see your sweet face on the screen here, and know that you´ll be this close. Todays card is also absolutely gorgeous, and I´m totally amazed by it, soooo gorgeous and beautiful as always hun. And to your question about what´s my best trip ever, then it´s definitely my trip to the US 1½ year ago, where I was sooo lucky to visit 15 states and got to meet with soo many great online crafting friends through several years and also wonderful old friend in real life and some family I hadn´t seen for many years. What a gorgeous card!! Congratulations! Wonderful and big news, I know everything is going to go smoothly. My favorite trip was to Israel, visiting the Holy Land was an unforgettable and beautiful experience. Looking forward to this Becca , to be honest i have not been viewing C&C for quite q while now ,but i will be viewing when you are on thats for sure. so see you soon, and dont worry you have all your friends rooting for you . Christine is so nice and will make you feel at home. I was hoping it would be Create and Craft that you would be on, I am so chuffed to be able to watch you! Oh, my dear Becca. I am so thrilled about this new venture for you. I can’t wait to watch each and every episode. You will be BRILLIANT!!!!!!! As for the best trip I ever took….hmmm. You know I have lived all over the world. Ecuador, China, Hong Kong, Papua New Guinea, and I’ve visited many foreign countries for vacation as well. But my favorite trip is still my trip in the autumn every year to Priest Lake in northern Idaho. It is my “restoring” trip, the place that just nourishes my soul. Hi Bekka! All the very best for your time in England! I know you will do so well! You are so deserving of this. So very many people have been inspired by you – more than you even think! You will do great! Just got back in October from my only bucket list trip – to see the Northern Lights. It was perfect viewing with a highly active sky. Went with my best friend and her 3 sisters and got to know each of them so much better. How very special. I know you have many fans in the UK and this has to be the most exciting trip you will ever take. I would go with you if I could. That would be a fabulous trip. The best trip I ever took was the first time I went to Ohio to visit my sister who have moved there to be with her family. We have gone back every year since and we having a crafting vacation. I always take all my dies and embossing folders and we craft sometime all night! I am so excited for you and can’t wait to see all of your new dies. Bet they are fabulous!!!!! I hope I win this “friend” card today as I am one of your oldest (not in age, but maybe) but as a long time follower! So happy I found your blog, I so look forward to FRIDAYS!! Good luck and God Bless, have a wonderful trip!! What exciting news Becca and the opportunity is just what you deserve after all your hard work. You are so talented and lovely but I will admit that I am jealous that you will be in the UK before you are here in the USA. Wishing you a safe journey to the UK. May it all go well for you and you get positive feed back. Be BRAVE! all will go well.Congratulations on this latest accomplishment! So excited and looking forward to your visit to the UK and your appearance on Create & Craft with Christine. You will be fabulous and you will receive such a warm welcome. The weather here is now turning colder so wrap up warm. I have a few of your designer dies and I am so looking forward to seeing your new dies. Absolutely stunning. So looking forward to watching. My Christmas presents have arrived early. A laser printer and a minc machine … excited but reluctant…. really need to have a play but so much on for now that i need to finish. Congrats Becca, so exciting. Wish you were coming down here to New Zealand. :) the best trip I ever took was when I came to America in 2007. I was in my 50’s and it was my first ever trip out of New Zealand. I stayed with cousins at the Outer Banks in North Carolina. Your thunderstorms were really scary. The lightning was incredible, I’d never experienced anything like it then or now and it always stays in my memory. Congratulations Becca I just wish we could get this program here in Australia. the best trip we ever took was a trip to America to Canada and the Rockies and then a cruise to Alaska, it was so good I have always wanted to do it again. I am so EXCITED for you and all of us who are your FANS! Believe it or not, I only discovered Create and Craft about 2 months ago. Great timing! I record every show and watch most of them live. Of course, I will be watching live to see you and I am thrilled you are going to be sharing your new COLLECTION on TV. What a blessing for you and for all of us. I predict an early SELL OUT!!! Oops! I forgot to include my best trip story! I hope it’s OK to add a second comment. The best trip I ever took was to a town near where I live to meet my new Grandaughter. I am not much of a traveler, but a couple years ago my community chorus was invited to perform at Carnegie Hall. I invited my twin sister (MD) to meet me (CA) in New York. We have a ‘ginormous’ family and we are usually surrounded by others when we’re together. But, for this trip I got to have her all to myself for a week. What a precious time. Certainly, singing in Carnegie Hall was pretty special but sharing it with my sister was the icing on the cake! No need for fear, Becca, (easy for me to say! )-just be yourself. Your warmth and enthusiasm will prevail and I am sure you will forget all about being self conscious as you focus on your passion. All that love & creative energy will start bubbling out! Hi Becca, how exciting! Wow wish you could come to Australia! You are a natural! Once you’re there all those nerves will disappear. I can’t wait to watch it & see your new collection. Best trip I ever took was to Malta. We took the children in 2011 to see where their grandparents & ancestors are from. They loved it! Learnt a lot of history & met many distant cousins. I will be praying for you! Remeber you are braver than you think! I have lots of PSX stamps, too. Some of them are quite coveted on eBay. Fantastic that you are literally going international! You will do fine on tv Becca…hoping I can get that station! I want to wish the best of everything to you on this new venture. Congratulations! I’m sure you’ll do great! I can’t wait to see your new dies. I can’t believe you’re going to be on TV. You are a brave girl. I think you’ll do just fine actually. You’ll have so many of us praying for you and you’ll be so excited to show the line that the time will fly. Best trip was a trip with our family at christmas to hawaii. Just sun sand and family time. Best of luck on your trip. Doing what you love will shine through and you will a star! Sending out love and prayers for a fantastic trip. What a gorgeous sentiment! You need to nudge Suzanne at Quietfire to do one of these!! Best trip ever… a family camping trip (tent and station wagon) to most of the national parks west of the Mississippi back in the 70s. We still tell stories from that trip! How exciting! Best of luck to you! How very exciting Becca. You will be wonderful and will get to spend time with a friend and do a little traveling as well. How wonderful. I will be up to my elbows with food and guests however, and will not be able to watch. Is this the only time you will be on CC?? Or is this an ongoing thing???? Wishing all the best. Enjoy. Beautiful card ! Can’t find words for how proud we all are of you !!! to U. K. wish I was in the U. K . NOW !!! I’m looking forward to watching you and will send in an email to C&C welcoming you to the U.K.
Best trip ever wasinspired by your BRAVE post and was to the Doctors to see about having my cataracts removed. I’d been putting it off and was struggling to see, so I went to my GP, then to the hospital and had the second cataract removed a week ago. The World is bright and the colours are wonderful, so thank you. A beautiful card with a beautiful sentiment. Looking forward to watching the show. Oh heavens, that’s me glued to Create and craft then. You’re going to have SO much fun, the presenters are all great so don’t worry. I’m really, really looking forward to seeing you. Hi Becca, Yippeeeeeeeeeeeee !! I’m so excited that you are coming to C&C, especially as you will be with Christine too. You need not worry at all !!! you will be fabulous, we all love you and everyone else will too. A fabulous card, love it !! I don’t go away as my hubby works for himself and never takes time off work (unless the workplace is closed), but periodically on a Saturday we have a drive to Lytham St Annes, we park the car in St Annes and walk to Lytham (takes an hour each way) we then have Fish and Chips in the ‘best’ fish and chip restaurant which was recommended by Gordon Ramsay and also Rick Stein, and it definitely is ‘the Best’, after having this we then walk back to St Annes to pick up the car. The air is fabulous as we walk all the way alongside the sea front. I love it !! Good morning Becca, yippee!!! At last oh my sweet angel I can’t wait!!! You will knock their socks off!! Don’t be scared you will be fabulous I know it!!! Your card today’s is breathtakingly beautiful as usual!!! I’ve been working that’s why this is late!!! My goodness me I’m never going to sleep!!! Every single holiday with my beloved George was the best ever!!! Every single holiday with my two daughters was the best ever!!! Oh Becca you’ve made my day!!! Have a safe trip!!! Eeekkk!!! Oh what wonderful news, well for us across that pond here in the UK to have you coming to our screens. Such a very talented lady that i know my friends are going to be as excited as i am when i tell them you are coming across. I will go and make sure my record buttons are working the now and get all your shows programmed in so that i don’t miss a single one. I love to see you when you put up a video of a make, apart from being so very clever you have such a beautiful voice that is quite hypnotic. I sincerely hope that you have a ball while you are across and you get to see the beautiful side of people and our beautiful country although to get the hills, you would need to come up to my beautiful Scotland. Have a wonderful time Becca and thank you so much for making my day flower. Your creations are sublime and inspirational,you will do a fantastic job demonstrating on your shows I know you will. Everyone here will welcome you and make you feel right at home. Ohh so looking forward to it now..
Becca, wishing you safe journeying to the UK. Have no fear of appearing on C&C……you will be bringing a touch of quality to the screen given the superb tutorials on your blog… really looking forward to seeing you and seeing your new dies. Jet lag travelling East is something else so rest well before and during your flight. Looking forward to watching you on Create and Craft and can’t wait to see your new dies. Hi Becca. Very late commenting as busy weekend, but your card as always is beautiful. The sentiment is beautiful too. I’ve had some lovely holidays over the years and have loved them all but I think my first visit to Venice was the most memorable. I fell in love with the island and it is still my favourite ‘city’ to visit. Your Dies are beautiful, you are a very talented lady. Thanks for sharing all you beautiful cards and projects with us. Hello Dear Becca. I’m so very proud of you. Though I only know what I’ve read about you through your postings, I can somehow relate to your life. To say I’m grateful to have found you, and this card especially now as a dear friend is facing end of life, is an understatement. You inspire my heart in so many ways. I’ll pray for God’s favor on you as you travel and grow through sharing His Word, one card at a time…. Love to you, Sweet Becca. Oh Becca, your new dies are exquisite. Oh, Becca, I watch Create and Craft almost every day. Imagine my excitement to see you on today. I told my new husband of three months that all your work is so beautiful. He immediately ordered your border dies collection. Yes, I have introduced him to stamping and find that he is very creative. I can hardly wait to get the collection and start playing with it. I am also looking on your site and on Spellbinders site to order some whole card dies. The best trip I ever took was my trip to Italy. After discovering that I had breast cancer and went for my treatments, I thought I wasn’t going to depart for Italy because of my treatments. Then I was fortunate enough to have been bumped into the night clinic for my treatments and I finished them just in time so that I could venture off to Italy with my family and visit my husbands relatives for the very first time after so many years. I was truly blessed to be able to go. I thank God everyday for giving me a second chance in life. God bless.